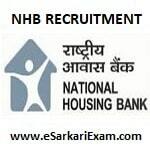 Eligible Candidates can Download NHB Assistant Manager Admit Card at the Official Website of NHB. Applicants First Open NHB Official Website. Click on Download E Call Letter for Online Examination of Assistant Managers Link. Open Download e Call Letter Link.